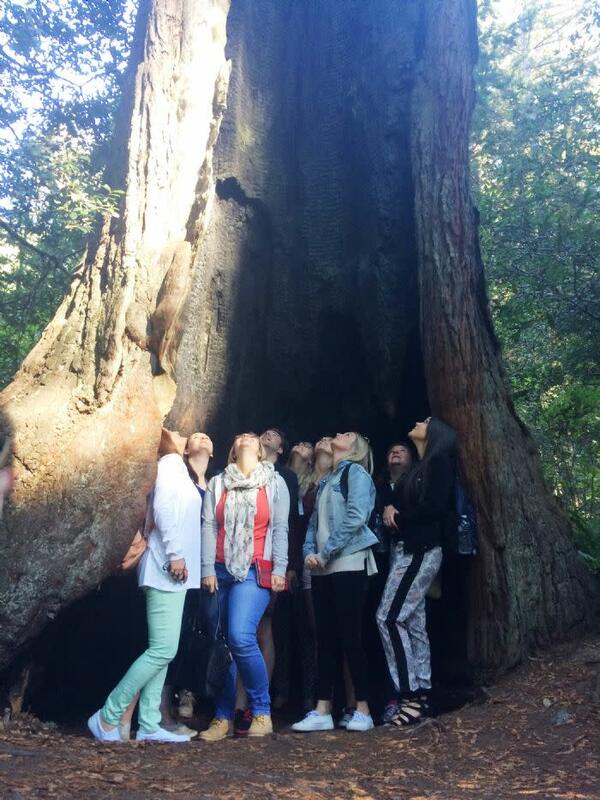 This walk among ancient redwoods and Douglas fir gives you an intimate look at a magnificent ridge-top redwood forest, with its complement of under story plants. 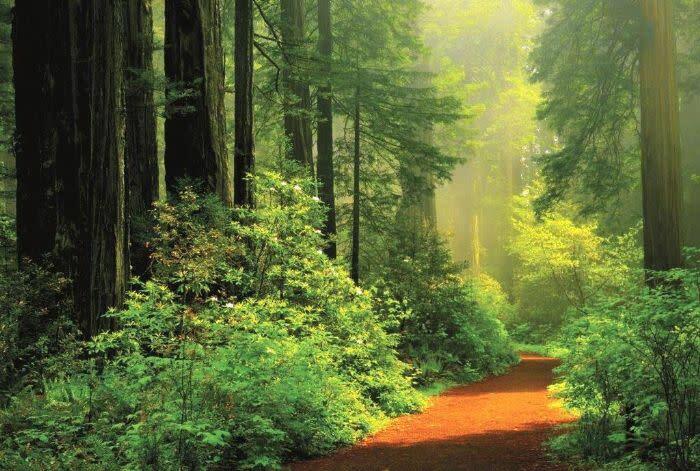 Lady Bird Johnson Grove rests near the top of a ridge in Redwood National Park, more than 1,000 feet from sea level. The moist conditions and the extra rain brought by the elevation causes the redwoods in this grove to look less red than trees of that sort found elsewhere on the North Coast. BEGIN: Turn right on Bald Hill Road, about 1 mile north of Orick on Hwy 101. Follow up the hill about 2 miles to the trailhead parking lot (with restrooms), and cross over the footbridge to the grove. 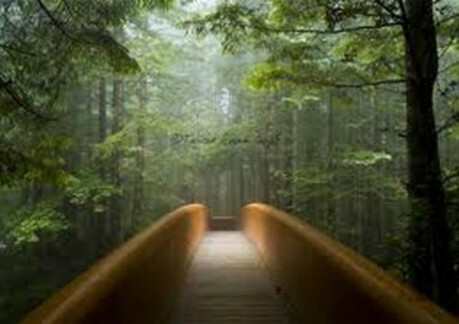 Across the bridge from the parking area is an easy one-mile loop through the grove along an old logging road. You can easily do the loop in a half hour and don’t forget to bring water. This grove has a more open feeling than some others and you can actually see the sky above the trees and photograph entire redwoods. These high, wind-whipped slopes and ridges offer redwoods a less favorable habitat than can be found in protected valleys. 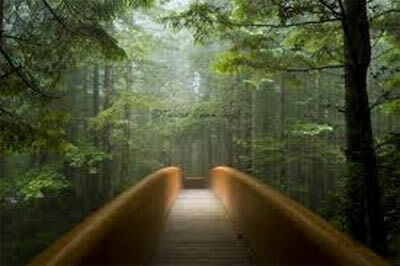 Here you will see them sharing space with many species of trees and shrubs. Colorful rhododendrons blossom from May to mid June and a great variety of ferns grow in shady, moist places on the forest floor. Lady Bird Johnson Grove Trail is also accessible from the Elk Meadow Day Use area. If the one-mile Lady Bird Johnson Grove trail loop isn't long enough for you, you can take the three-mile Berry Glen trail to the Grove. More "Hikes and Trails" in Northern Humboldt County with a map. In August 1969, President Richard Nixon dedicated the grove to Lady Bird Johnson. Sadly, Lady Bird Johnson passed away on 7/11/2007 at the age of 94. She passed at her home in Texas, surrounded by friends and family. She was an environmental activist as well as former first lady. 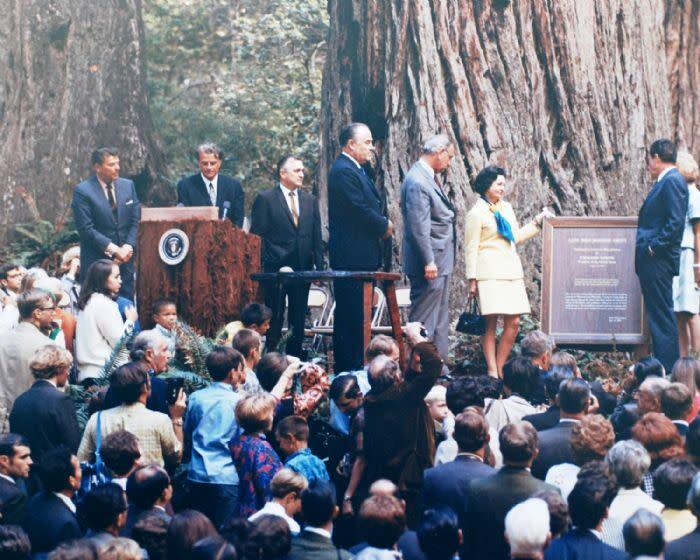 Above is a video clip of Lady Bird Johnson visiting the redwood grove named for her. The Video in Real Player Format.